Our recent speaker, Peter Heredia of MaxSale Solutions shares his Sales Coaching expertise. MaxSale Solutions is a consultancy firm helping companies cut through the issues that are limiting increased sales. Unlike traditional sales training companies, they know that it is as important to increase the efficiency of a sales team by managing activity as well as improving their sales skills. Coaches, wherever they operate, be it sports, business or sales coaching, all have a similar goal – guiding, supporting and challenging people to achieve higher levels of performance. In sales, this results in individuals and teams delivering better revenue results by building on and developing existing skills. The main difference between old style sales management and the new world of sales coaching is that the focus is on the individual’s strengths rather than how to “fix” weaknesses. Whenever I have run a sales leadership workshop, I always ask attendees if they have experienced the situation where they have asked their sales members several times to complete a task and still it doesn’t get done. There is always a sea of nodding heads, looking at each other and agreeing that it has happened to them. The consensus is usually that salespeople just don’t listen or don’t like to do what they’re told. The result is that the sales person very likely didn’t see the task they same way as the sales leader did. They had not taken it on board as a priority. Why? Because they were simply told what to do. This is not enough for today’s busy sales people. 2. Coaching Is Most Effective When It Has Structure And Is Focused. 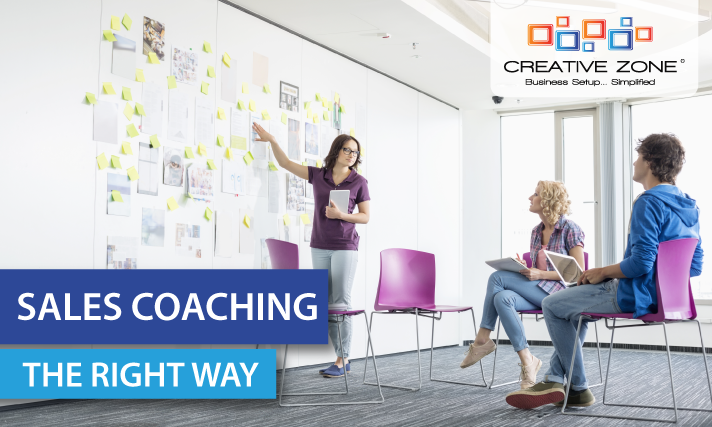 A simple 15-minute structured coaching session around a single topic will ensure that the team you coach will become much more productive for the next 40 working hours until you sit down again. The reason why you only choose one subject is that it is so easy to overwhelm the sales person with too many things to look at and when this happens, nothing gets done. 3. Document What You Have Agreed. Make sure you don’t only get them to realise what they need to do but also HOW they are going to do it. Often sales people commit to tasks and they haven’t really thought through how they are going to achieve them. Therefore, once you have agreed on their objectives, spend some quality time ensuring they will work out how to execute. At CREATIVE ZONE, we provide UAE Startups and SMEs the platforms to start, run and grow their company. We specialize in all types of company registrations, from Offshore to Onshore and UAE Free Zones. CREATIVE ZONE goes beyond the business setup process, providing clients with the tools to promote, develop and grow their businesses. Attend one of our business workshops and exclusive client networking events and gain valuable insights from industry experts on how to improve your business processes and network with like-minded business people.